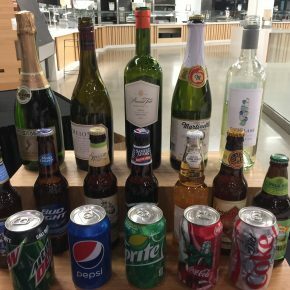 “We’re used to trying new things out and learning what works,” says Jeremy Macdonald, Regional Site Operations Manager at Adobe in Lehi. So when the company’s “Utah Artists & Adobe” initiative was launched this year, Macdonald knew they would be learning from the experience and tweaking the project. 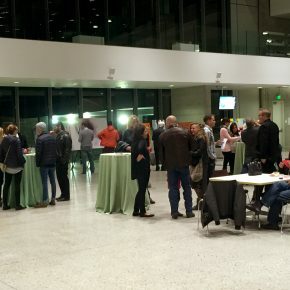 Version 1.0 opened Jan. 15 at the iconic building that juts out from the Silicon Slopes above Lehi. 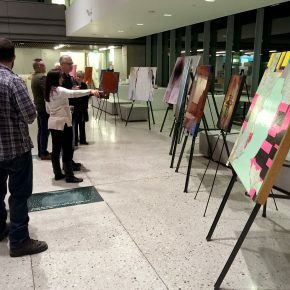 Seven Utah artists were invited to participate, their works displayed on easels in the building’s large atrium, which provided plenty of room for guests to mingle. 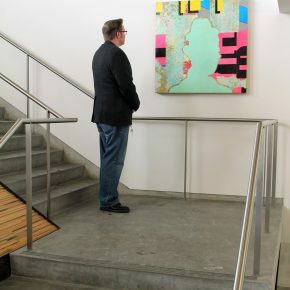 “It was great to have so much space, because it gave the artists a chance to stand back and watch people’s reaction to their work,” says Andrew Ehninger, a local artist and curator whom Adobe engaged to facilitate the project. About 150 people attended the event, a third from within Adobe, and the rest from the public at large. 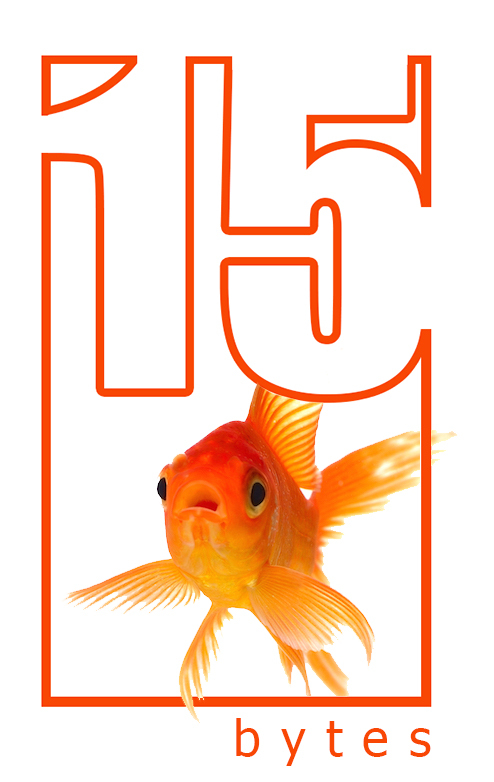 Moving forward to October 2015, an opportunity emerged to experiment with a solution. 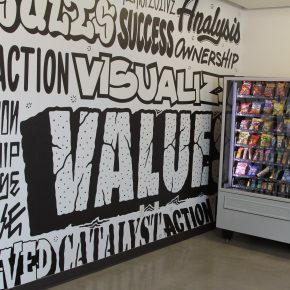 Ehninger, whose wife also works at Adobe as a Senior Front End Coder, suggested the space could be a sort of revolving gallery, bringing the local community and Adobe staffers together, and “Utah Artists & Adobe” was born. Access and security are some of the issues Macdonald and Ehninger are wrestling with as they bring this concept to fruition. 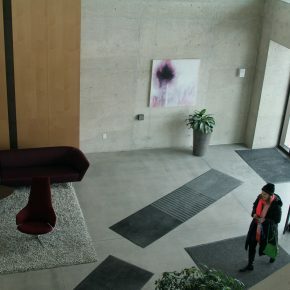 Since Adobe is a corporate building, with visitors required to register before entering, and some parts of the building completely off-limits to outsiders, it’s certainly not like a commercial gallery, or even most public spaces. 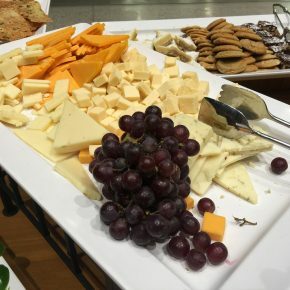 Access to the work is limited, which is why the public artists’ reception in the atrium was scheduled. 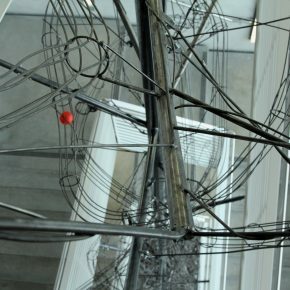 After the reception, the work was moved to two high-traffic areas, both bathed in natural light, for permanent installation—well, permanent in the sense of three months, until version 2.0 is released in April and a new batch of artists featured. Ehninger selected the work for 1.0 from over 60 submissions on the project’s Behance page. “I wanted to create a mix of artists, old and young, male and female, established and emerging,” he says. 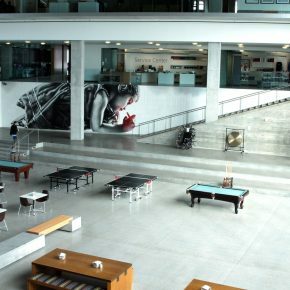 Principally he sees the Adobe project as “giving people an opportunity.” He and Macdonald point out that the building houses 1,200 employees and receives over 30,000 visitors annually. 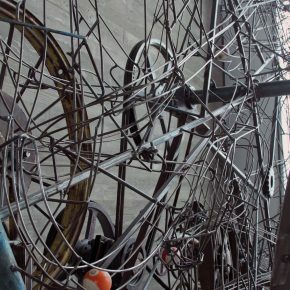 In addition to having their work seen by this many people, the participating artists become associated with a global brand. 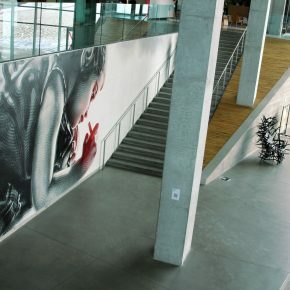 Macdonald points out that Adobe has purchased artwork for the building, including local work. 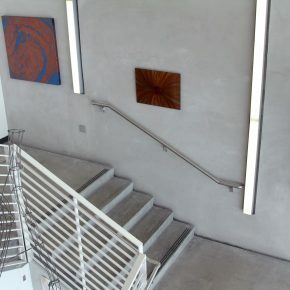 Los Angeles street-paint artist El Mac (Miles MacGregor) created a wall piece for the building’s atrium, and two kinetic pieces by local artist Andrew Smith are part of the building’s permanent collection, including one that spirals down the stairwell where the temporary work for “Utah Artists & Adobe” is installed. “Utah Artists & Adobe” is a local project with local initiatives, Macdonald emphasizes, and the program is meant to benefit both employees and artists. 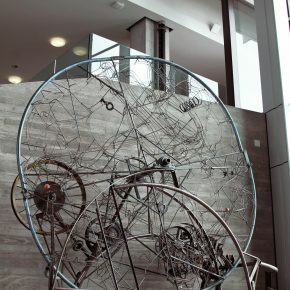 While the temporary display of artwork doesn’t fit within the building’s current insurance policy, Macdonald says he has juggled some things in his own budget to cover any problems. 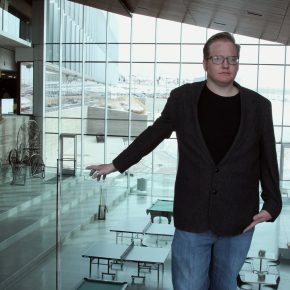 And he’s investigating ways other local not-for-profit exhibition spaces work with artists. They’re also working on some of the micro-issues for version 2.0: Macdonald will print the postcards for the event earlier so artists have more time to promote their work, and will switch the night of the opening so it doesn’t compete with other exhibition openings. The next “Utah Artists & Adobe” is scheduled for May. 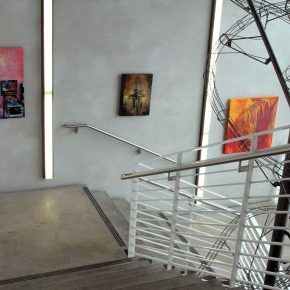 Artists are invited to submit works to Adobe’s Local Utah Artist Behance page for consideration. 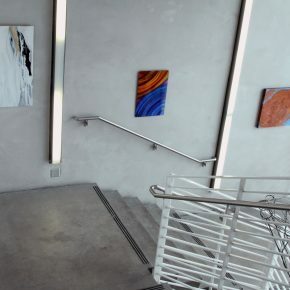 Currently on display at the Adobe building in Lehi are Trent Call, Andrew Ehninger, Josh Epperson, Shane Fox, Jerry Hardesty, Ran Stewart and Whitney Horrocks. This article appeared in the February 2016 edition of 15 Bytes. Great article! I’m glad the issues of insurance for the art and compensation for the artist were both dealt with directly. The writer didn’t gloss over them nor pretend they weren’t worthy of addressing. And while a solution hasn’t yet been reached (because solving them isn’t as easy as some might think) it makes me content that they are in the developers’ sites and a compromise is actively being sought after. Just like their software, Adobe has identified some bugs and has experts working on fixing them and other micro-issues. Instead of throwing out assumptions and boycotting this event, I’m going to put away my “jump to conclusions mat” and keep an open mind about what is truly an awesome opportunity. It’s here specifically for Utah artists and can only get better in time! Hell, it may even influence other companies to follow suit!